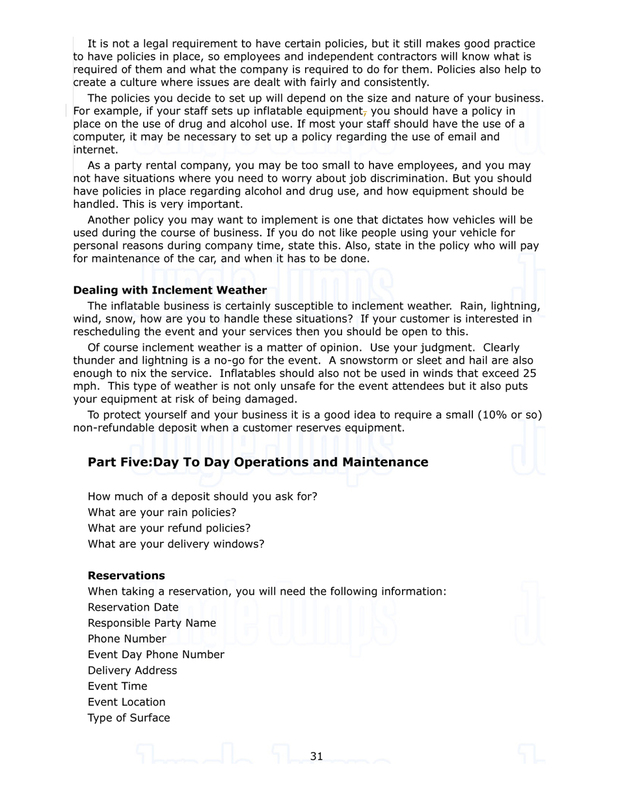 • Cost of the service and what is included• Safety rules for using the equipment• Inclement weather alternate plan• Signatures and dates by both partiesIt is also important to include a liability waiver in the inflatable industry. This will mean that in the event of an industry your company cannot be sued by the injured party. Setting Up Your Business PoliciesAs a party rental company, you may not have to create policies for employment purposes, but you are legally required to have written policies on certain things such as disciplinary and grievance procedures and health and safety, especially if you do have five or more employees. It is not a legal requirement to have certain policies, but it still makes good practice to have policies in place, so employees and independent contractors will know what is required of them and what the company is required to do for them. Policies also help to create a culture where issues are dealt with fairly and consistently.The policies you decide to set up will depend on the size and nature of your business. For example, if your staff sets up inflatable equipment, you should have a policy in place on the use of drug and alcohol use. If most your staff should have the use of a computer, it may be necessary to set up a policy regarding the use of email and internet.As a party rental company, you may be too small to have employees, and you may not have situations where you need to worry about job discrimination. But you should have policies in place regarding alcohol and drug use, and how equipment should be handled. This is very important. Another policy you may want to implement is one that dictates how vehicles will be used during the course of business. If you do not like people using your vehicle for personal reasons during company time, state this. Also, state in the policy who will pay for maintenance of the car, and when it has to be done. Dealing with Inclement WeatherThe inflatable business is certainly susceptible to inclement weather. Rain, lightning, wind, snow, how are you to handle these situations? If your customer is interested in rescheduling the event and your services then you should be open to this. Of course inclement weather is a matter of opinion. Use your judgment. Clearly thunder and lightning is a no-go for the event. A snowstorm or sleet and hail are also enough to nix the service. Inflatables should also not be used in winds that exceed 25 mph. This type of weather is not only unsafe for the event attendees but it also puts your equipment at risk of being damaged.To protect yourself and your business it is a good idea to require a small (10% or so) non-refundable deposit when a customer reserves equipment. Part Five:Day To Day Operations and MaintenanceHow much of a deposit should you ask for?What are your rain policies?What are your refund policies?